Call attention to VIPs, sponsors, staff and more by attaching bright and functional badge ribbons to their name tag or badge holder. What is a badge ribbon? Badge ribbons are flat pieces of ribbon that can be either attached to a name badge or used as other promotional material. Many of these ribbons can be ordered as custom or stock and both have their own benefits. They can be printed with information that identifies speakers and staff or an assortment of other functions of people during conferences and other meetings. These imprinted ribbons prove to be valuable networking and marketing tools and are great for brand recognition. How effective are badge ribbons? 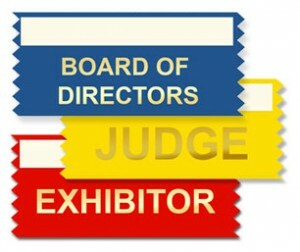 The effectiveness of these ribbons can be seen commonly at conventions and conferences. They provide attention getting messages as well as giving off fun and conversational quips. Each badge ribbon is a colorful attention grabber that helps others in a functional way to realize what the wearer is all about. This can range from titles to duties and even to a funny message. They are great for marketing, brand recognition and promotional tools. The list of who would wear one of these useful ribbons is endless. From speakers and presenters to officials and VIPs the titles are abundant. While most titles are available as stock ribbons, if you don’t find what you’re looking for, create your own custom ribbon. The most popular reason people wear ribbons is to identify specific titles or traits they might possess. They are also worn to market someone for their job responsibilities. Or, simply wear a badge ribbon with a silly message or word. With custom ribbons, text can be created to send any message the wearer wants. Where are these type of ribbons worn? Ribbons are worn in many places. Conventions, meetings, conferences, retail settings and professional office settings are just a few of the many places you can find badge ribbons. When are badge ribbons most useful? These imprinted ribbons are perfect for any fair, sporting event or other achievement day. Promote events and sales at conventions, conferences and meetings with classic badge ribbons. They are perfect for identifying titles or responsibilities of the wearer. And, they are extremely useful when promoting your brand or image.